As many of you know, KDE neon is a special distro to bring the really latest KDE version from The KDE Project itself. KDE neon is a stable operating system as it's the official OS of Slimbook Laptop and actually I used it daily. 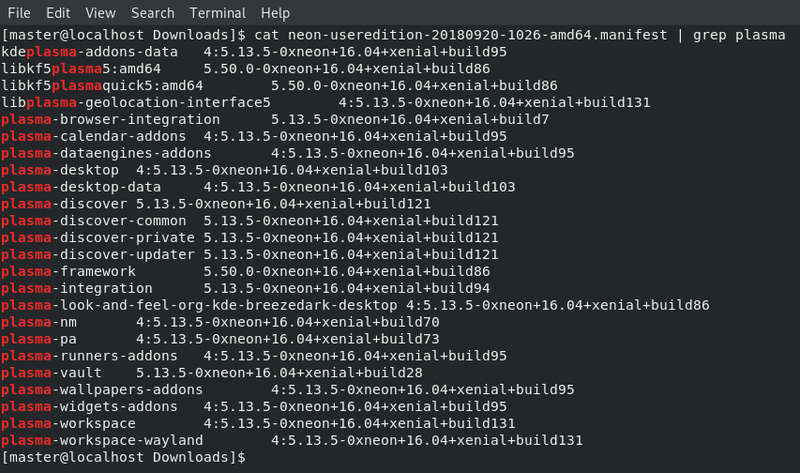 But, KDE neon is available in User and Developer, Git-Stable and Git-Unstable editions. Previously, it even has a User LTS Edition. This may hinder us to download as we're not sure the version of packages inside it. How to know the differences between them before downloading? This short tutorial shows you the examples. See .manifest file. It's available in each download page of available editions. A .manifest is a text file containing list of packages within the ISO image file. Sounds interesting, no? Content of a .manifest file is simply lines of package names and their respective version numbers. 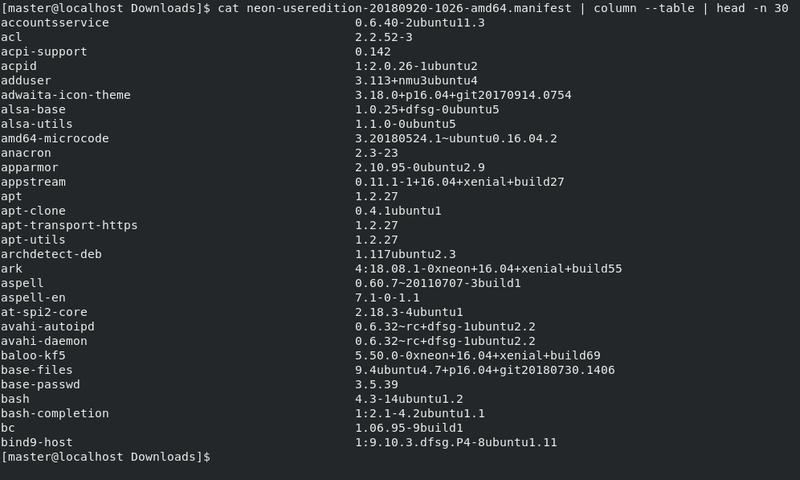 For example, below is .manifest file of KDE neon User Edition 24 September 2018. 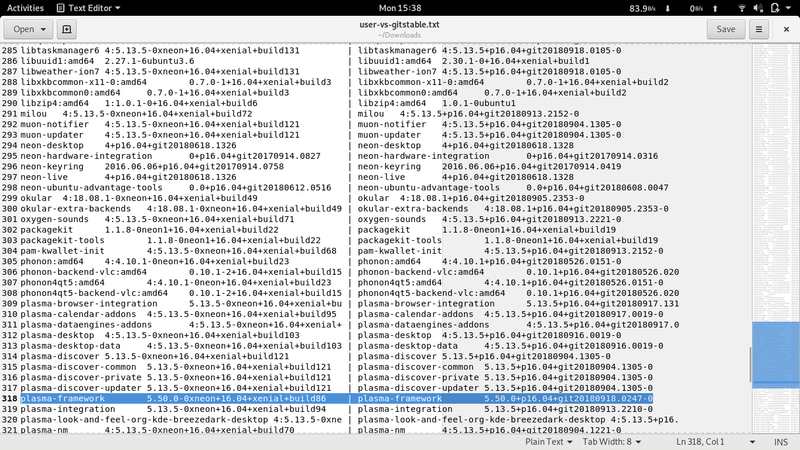 You can clearly see left=package name and right=its version number. What to check are number, name, and version of packages. In particular, this means you check whether or not this ISO image contains Plasma Desktop 5.13 or such. You will use some fun but truly useful command lines: wc -l, diff -y, grep, column --table, and head. How many packages are inside? What packages are available? What's their versions? This one is really useful to satisfy your curiosity about what's different between both. Take useredition.manifest and devedition-gitstable.manifest as example. Compare them. See version differences? See where is kate belong? How many packages in them? What built-in packages are different? Whats the biggest difference between them both? Anyway, this simple tutorial is just the basic. 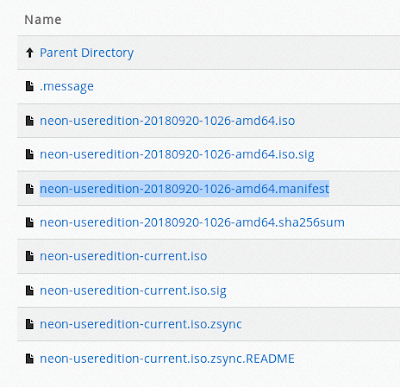 At least, now you can analyze whether an ISO image matches the latest KDE Release Notes or not, whether it matches program version you want to test nor not, and so on. Go ahead. Try KDE neon and enjoy!